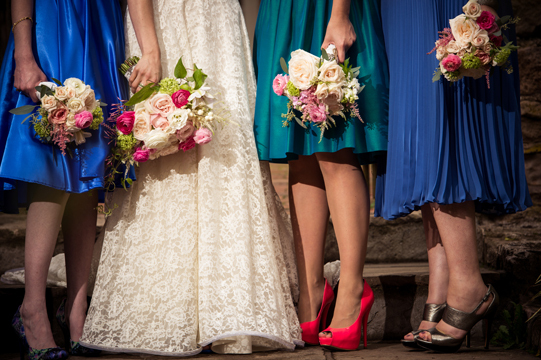 Spring has sprung (sort of) here and we’re getting ready for the start of wedding season. 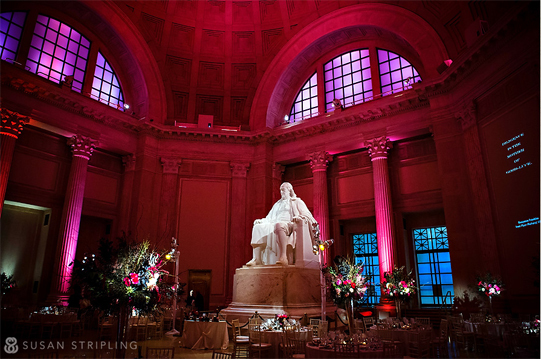 One of my favorite venues in Philadelphia is the Horticulture Center in Fairmount Park. We’ve done some amazing weddings at “The Hort” with the Starr Events team so while we’re looking forward to an awesome 2014, it’s nice to look back at Simone & Rich's beautiful wedding from November. Enjoy! 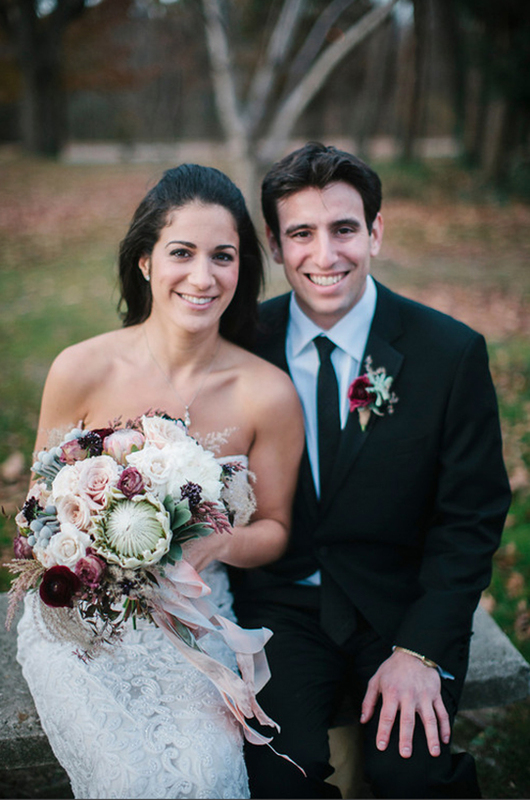 I was incredibly proud of Simone’s bouquet, sometimes the floral palette just comes together in a way I couldn’t possibly predict and it’s even better than I imagined it! 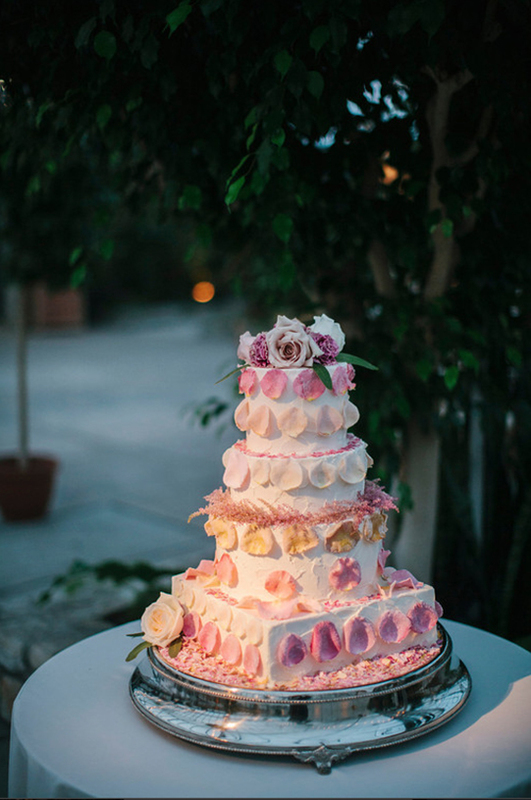 The gorgeous cake by Whipped featured edible rose petals we sourced and fresh floral added on site. It was a fun and tasty collaborative process! 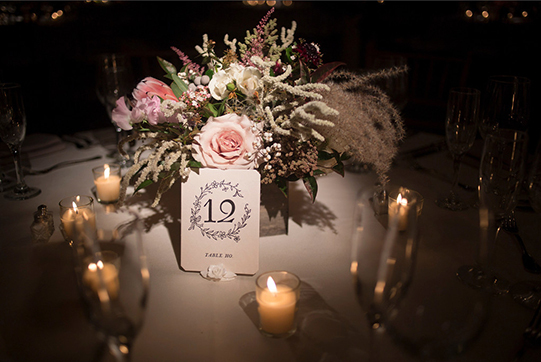 Do: Organize the details of your big day into separate boards (i.e., Fashion, Décor, Floral, Beauty). It’s ok to keep one master board of your favorites, but a board with 300+ images is going to be hard to sort through with your creatives. Do: Consider this: Most great designers use Pinterest as a portfolio, so pay attention to how much of the designer’s own work they feature vs. how much they pin from other people. (You’ll quickly be able to tell the trendsetters and tastemakers from the followers.) And do remember that when you work with a creative professional, they should be able to find a way to communicate with you and design for you using their own work and ideas. Don’t: Assume that every design you see on Pinterest will fit into your budget. Remember that Pinterest is a curated version of a designer’s work, a place where they feature their best images and ones that likely represent a fair amount of editorial shoots or over-the-top designs. Don’t: Even if you find the most amazing photo of ____fill in the blank____, don’t bring it to your designer and ask them to copy it. Truly creative and talented people should be designing for you. Instead of asking us to copy our own work or, even worse, someone else’s, let’s talk about what exactly it is you love about that particular design. It’s our job to interpret that information and create something just for you. The most amazing designs usually result from clients giving us a little inspiration and a lot of trust to do our thing! And be sure to check out The Styled Bride's gorgeous new website, we have some fabulous weddings in the works together this year! 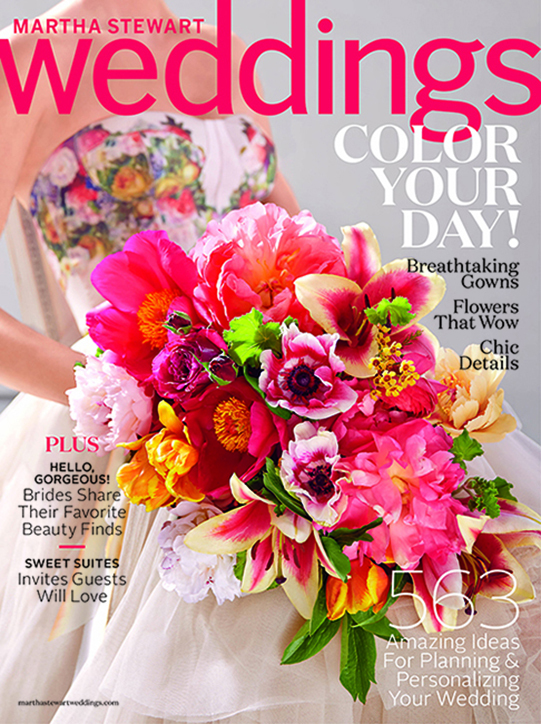 Setting your budget for floral and decor: Setting the budget for your wedding is an important task. It’s about finding the balance between the wedding you want and the wedding you can afford. 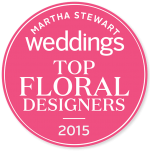 If you don’t love flowers, well you’re probably not reading this blog so let’s focus on you brides who love flowers and more specifically my designs which are lush, textural and full of all kinds of seasonal and interesting flowers. You’ve got your date, the venue, the photographer and the dress. You might have even used one of those handy wedding calculators to help you budget. Well, it’s been my experience that those work just fine for those brides that don’t really care about flowers. But that’s not you. You found me because you saw my work in a magazine, on a wedding blog or one of the vendors I work with often raved about me and my team (because we are super awesome to work with by the way) . Let’s go back to the calculator, sometimes those calculators spit out downright unreasonable numbers, like $500 for a reception with 25 tables. I don’t know a florist in Philadelphia who can do a centerpiece that looks like something on my site for $20 each. I’ve seen those calculators suggest that the floral budget should be 4-8% of the overall budget. When you work with a creative designer who works in season with an abundant and lush style, that budget percentage may go to 10-12%. If you want custom designed ceremony backdrops, a lavish chuppah or suspended floral designs or full towering tall vase cascading above your tables then you might be closer to 20%. My suggestion is to get an idea of pricing for your florist before you’ve booked every other vendor. 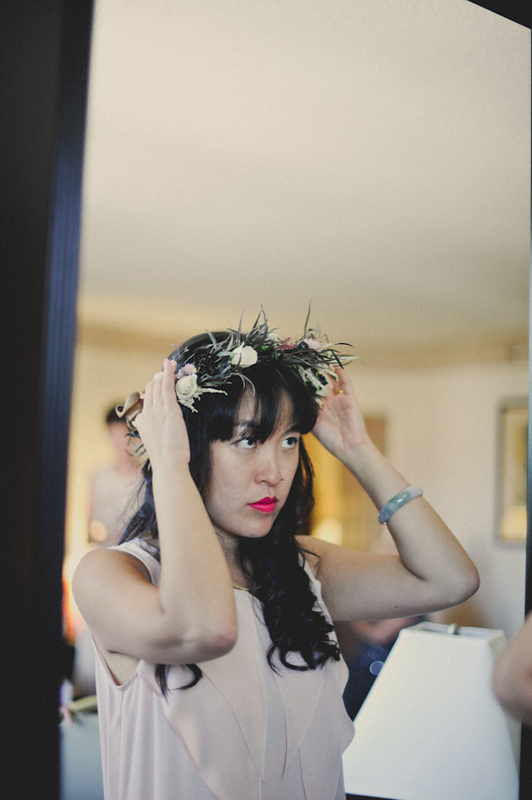 Sometimes when brides come in 4-6 months before the wedding, the only place left to cut is floral and décor and we hate to be the bearer of bad news. And if you’ve had to cut you floral budget, you might not be able to have everything on your wish list. It’s about adjusting your expectation along with the budget. Book your appointment early, I’m happy to give you an estimate a year or so before your wedding that way you can have the look you love at a price that works with the rest of the wedding. I think it’s better to have all the information first and then you can make your decisions. We also book up early for key wedding weekends so this way you can make sure we’re available for you as well. 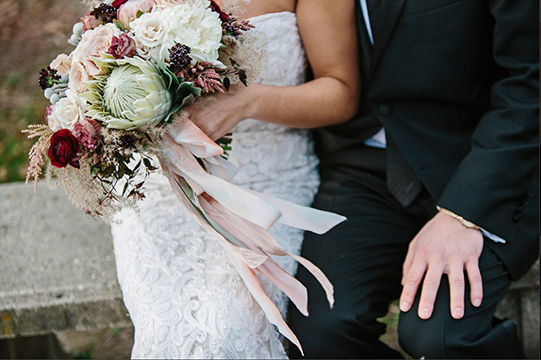 As always, don’t hesitate to reach out if you have questions about your wedding, we’re happy to help! It's really nice when we get to stay in touch with our couples. Laura & Steve were married at Holly Hedge back in June of 2012. Steve is sweet enough to send Laura flowers on occasion so we still hear from this lovely couple. Laura loved green, both the color and the texture of greenery, ferns and foliage. 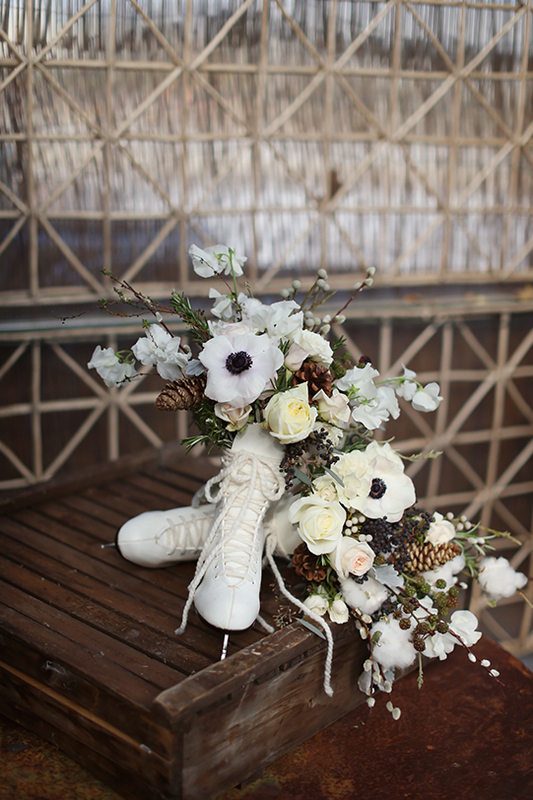 What she didn’t like was any traditional face flowers which initially stumped me but in the end I loved the results. 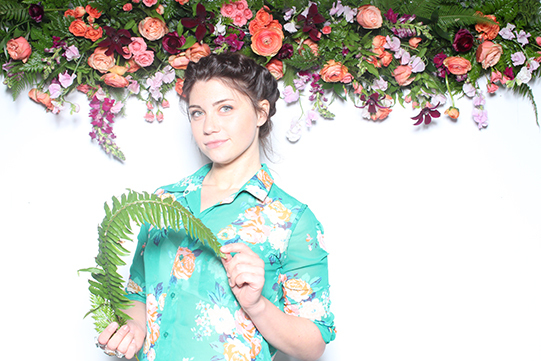 Each bridesmaid carried a single type of bloom and I think the effect was very cool. Thanks to Love Shack Photo for the images! We're in the midst of a crazy busy wedding season so the blog has been a bit silent. I think for the next few months I'm going to have to just pop by with some recaps, I'll be back to creating regular content in November. We have 20 something weddings left this year so there's sure to be lots to share as the photos start to come in. This morning I'm enjoying the quiet in the studio before the crazy afternoon, one wedding is already on it's way to a distant location and we have 3 this afternoon. I'm super grateful for my staff as well as our fabulous interns who I hope are learning a lot, we work really hard and it's hard to relax in between weddings. Our weddings have been very diverse this year and as I look back as the spring/summer season I'm really proud of the work we've done. I'm off to tackle delivering all these flowers! This week we're introducing 3 new regular blog features! Today it's Wednesday Weddings where we'll be showing off our Real Weddings along with Wedding Inspiration & Style Shoots for Weddings that we regularly work on. 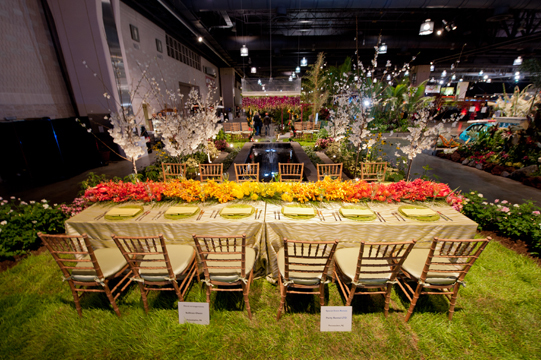 This year for the Philadelphia International Flower Show, Sullivan Owen partnered with the Parks and Recreation Department and Starr Events to throw a "Wedding in the Park". 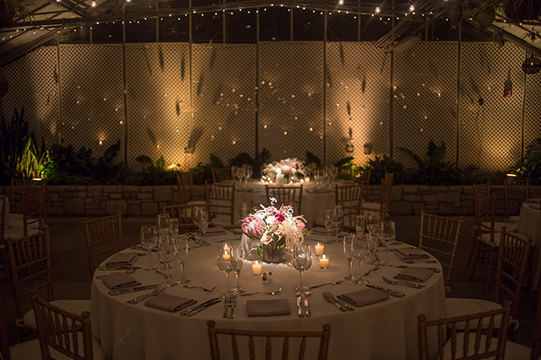 We work with Starr Events at the Horticultural Center in Fairmount Park all the time and we love designing weddings in the fabulous event spaces. The Parks team did a phenomenal job of creating the gorgeous reflecting pond flanked on both sides with stunning cherry blossom trees with spaces for our Ceremony and Reception designs. 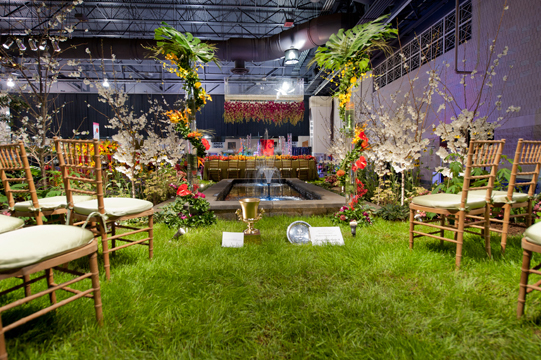 We worked exclusively with Hawaiian flowers as Hawaii was the theme of this years show. I can't get enough of Ombre and used the vibrant shades of the tropical flowers to their maximum effect. I love creating new ways to display flowers and designed this massive floating chandelier vase. The chandelier was a labor of love and I can't wait to use this again with different color palettes. Enjoy! I'm so happy to share a sneak peek of our work for this year's Philadelphia International Flower Show. It was such an honor to be asked to collaborate with the Philadelphia Parks & Recreation Department and Starr Events to throw "A Wedding in the Park". 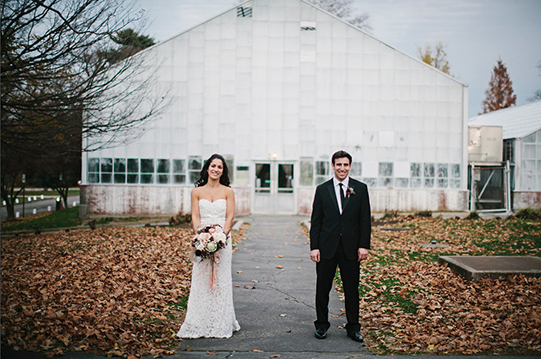 The team was inspired to share the gorgeous weddings that take place at the Horticulture Center in Fairmount Park. My floral design concepts were directly inspired by this year's theme "Hawaii-Islands of Aloha" . I took a completely modern approach using only tropical flowers and clear acrylic. I'm definitely feeling more tropical weddings this year, color everywhere! We worked on three separate designs. First up is my Dendrobium orchid chandelier. This was true labor of love and a team effort to complete. The chandelier design is functional and holds water so the flowers will stay hydrated. I can't wait to try it with different flowers! Here you can see Sammi and I standing over the fountain placing hundreds of orchids into the chandelier. No one fell in fortunately! You can't have a wedding without a great ceremony space. Finally, the 16 foot floral runner centerpiece. This was so much fun to work on and makes such an unbelievable impact. You can see it all the way across the room. I hope you'll check out the show from 3/4-3/11. The experience of being behind the scenes has given me a whole new perspective and there are some truly awesome displays to see this year! 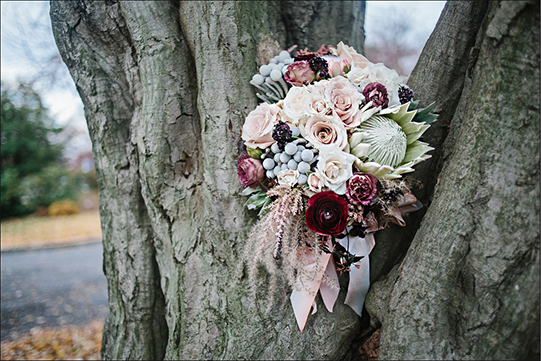 We're so happy to share that we'll be showcasing inspiring new designs at the Terrain Bridal Open House next Thursday March 1st as their preferred floral partner. Terrain will be unveiling their newly redesigned event space and serving up their delicious hors d'oeuvres while we mix, mingle and answer questions. For all you brides out there who have been wanting to see our work in person, this event is a great opportunity to do so and you'll also get to meet the fabulous Alison Conkin, be dazzled by Two Paperdolls' innovative designs, scope out an apparel preview by BHLDN and sample tasty treats from Coco Love Homemade and our favorite treat tricycle Little Baby's Ice Cream. We will be unveiling more floral adventures with Terrain in the coming months so stay tuned! See below for RSVP information and we hope to see you there! It just hasn't slowed down around the studio. We've been spreading the holiday cheer all over town with tons of holiday parties, wreath classes, a winter wedding and loads of holiday designs. Things are winding down slowly and we'll be taking a bit of time off for the holidays, something I have never really done before! Holiday means family time and this week T.O. and I got to visit with my Aunt Cheryl & Uncle Richie who were in town to visit Longwood Gardens. I thought I would share just a sneak peek from our recent shoots. The first two shots were captured by the awesome Lorraine Daley a few weeks ago. Next up is a behind the scenes shot and a completed shot from a floral hair piece shoot that I put together with some of my favorite local pros. Jillian McGrath on film, April Chatman-Royce on makeup, Brianna on hair and SO on floral, fashion and styling. I'll be keeping the rest under wraps till the new year when we'll be adding tons of new work to the website and of course shots from all our weddings this year. It's so hard to edit, we've had such an amazing first year this year! 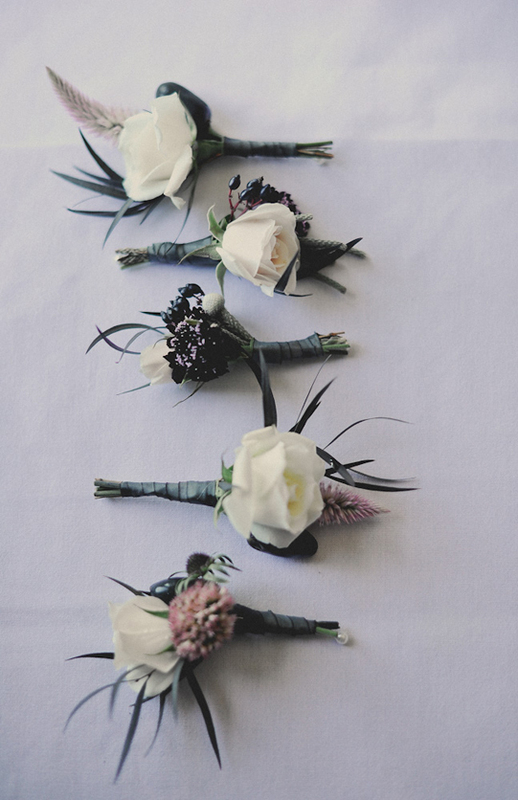 We recently designed a few floral pieces for our gorgeous bride Katie. Katie requested a "Pippa" style hair piece that she could wear with her hair half up and the result is so beautiful. Katie also requested a show stopping piece for her too cute for words flower girl. It's impossible not to squeal when you see the photo of her! Here are a few stunning photos from the always amazing Heidi of Our Labor of Love. 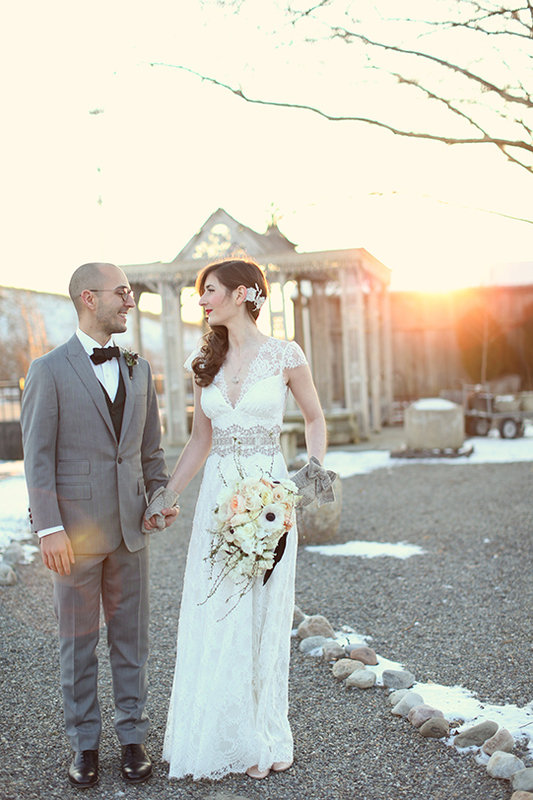 Appleford Estate is a gorgeous venue outside of Philadelphia. Starr Events is one of the caterers for Appleford and they recently hosted an Open House to introduce clients to their fabulous food & drink and they invited some of their favorite wedding professionals including Sullivan Owen to attend. The evening was styled by our great friends Styled Creative, filmed by Cinema Cake and photographed by Sarah DiCicco. We all had so much fun with Loveleigh Invitations, Little Baby's Ice Cream and Eventions. All florals by Sullivan Owen.